Clementina Flores was born in 1947 to a working class family in the Mexican state of Guerrero, located in the beautiful Pacific coast. Clementina was raised by to strong willed, skillful farmers and business people. The tricks of the trade that she carries with her were mostly learned on site, in her home, or in practice, working for her parents. The fifth child born to a family of six, Clementina’s parents, Abel Flores and Zenaida Abarca, each had their role in the upbringing of her and her siblings. He was a skillful farmer and businessman. He had a wide-ranging knowledge of agriculture and agri-business. His production included: beans, peanuts, corn, sugar cane, exotic fruits. Abel’s work was his passion and it showed in his children. Her mother was the head of the household, per se. While Abel was working the farm, Zenaida cared for Clementina and her siblings, all while making sure the household was taken care of.Clementina married at the young age of seventeen to Baldemar Bahena in Tepatulco, Guerrero. The marriage of Baldemar and Clementina had an interesting dynamic to it. Their relationship was as much a relationship based on love as it was about business. Clementina, who thanks to her Father, Abel Flores, and his lessons on business, was the help to her husband Baldemar’s farm and dairy production needed to become very successful. With her know how in administration, she helped Baldemar get the most out of his ventures in the farming business. In 1966, Clementina’s and Baldemar’s first child, Generoso, was born. Geno, from an early age on, learned the family business from, literally, the ground up. He was immersed in his father&apos;s orchards, livestock; as well as, with the harvest seasons. His first lesson of the kitchen were not given on a counter top, but on the fields and lands of his native Mexico. Clementina not only raised her children and help her husband Baldemar, but also was a teacher teaching dress making, design, sowing, and she had her own beauty shop were she also get a lot of prestigious accolades. Unfortunately, tragedy struck the family all too soon. In the year of 1982, Clementina’s husband, Baldemar, died at the young age of forty four. With the death of Baldemar, the task of managing the farm and retail store, all while caring for her children Tomas and Anabelia, became overwhelming. She then decided to sell the ranch and the orchard and stay with the retail store until, the dress making to support her daughter Anabelia until she graduated from modeling and fashion design school. in Cuernavaca Morelos. Then, in 1993, Clementina and Anabelia came to live with Geno and Tomas in Chicago. During this time, Clementina came to the attention of Rick Bayless and was hired to be the nanny of Layne, Rick and Deanne Bayless’ daughter. While serving as Layne’s nanny, she also helped her son, Chef Geno Bahena, with his catering service and cooking classes. Then, after serving as Layne’s nanny, she was hired to work at Food Life in the Water Tower, for the Mexicanita section, as a chef consultant. With this new position, she was able to come out with new ideas for la Mexicanita and brought to light the rare gastronomic specialties of the Mexican state of Guerrero.Then in 1999, Chef Geno Bahena leaves Rick Bayless’ Frontera Grill and Topolobampo after twelve years of service of working as a Managing chef to partner with his brother, Tomas, in opening the nationally acclaimed Ixcapuzalco Restaurante. Now as owners, the brothers pleaded with their mom to leave her position at Food Life to join them in their new venture. Though it was hard for her to leave her position at Food Life, she accepted their proposal and joined their endeavour. In addition to learning all the gastronomical specialties of the regions of Mexico, Clementina’s strong roots come early on from life. For example, when she lived with her mother-in-law, Juana Arranda she learned the family secrets of fine Mexican cuisine, especially in mole making, and to this day she has not shared her secrets to neither of her sons. With the start of the new millennium, much change was going about in the Bahena family. In the year 2000, Chef Geno opens his second restaurant, Chilpancingo, a nationally acclaimed restaurant as was Ixcapuzalco. In June of 2002, Clementina and her son, Geno, went to New York to serve a dinner for the James Beard Foundation. Also in August of that same year, they catered a party in the white house for mr president George Bush in Washington, D.C. same year they cater at the Capital building for a thousand people representing five different states of Mexico. In addition to various events throughout the year, Clementina organized a forum titled, “Mexican Chef Society”. In 2003, Clementina and her son, Geno, catered an event at the Mexican consulate in Chicago, which was having as its guest, Vicente Fox, president of Mexico from 2000-2006. Change was to be a reoccurring motif for the Bahena family, yet this was not to alarm them nor discourage them from continuing with their ventures. 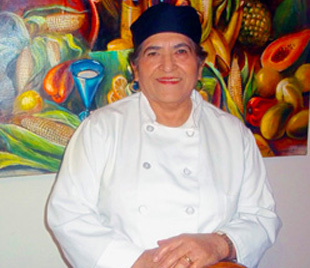 In 2004, Ixcapuzalco closed and Clementina went on to work as a chef for Chilpancingo. As the saying goes, one door closes and another one opens, this was the case with the Bahena family. In 2006, Chilpalcingo is sold; however, as this occurred a new beginning for the family business was to take place in the form of Sol de Mexico. During this time, Chef Geno goes to L.A. to open Mal Verde while Clementina goes to work for Anabelias fiancée, Carlos Tello, at Sol de Mexico. Chef Geno likes to joke that Carlos not only won over his sister, but also his mother. Presently, Clementina works as a chef consultant; as well as, lead chef for Sol de Mexico. She has received numerous awards and recognition from prestigious institutions, colleagues and the press alike. Clementina continues to have a burning passion for what she does. She is an alchemist of the kitchen who preserves old customs, yet stays on the cutting edge of the culinary arts. In the kitchen she is adventurous and innovative, preparing extraordinary food that departs from the ordinary Tex-Mex mainstream, to wonderful works of Mexican cuisine.